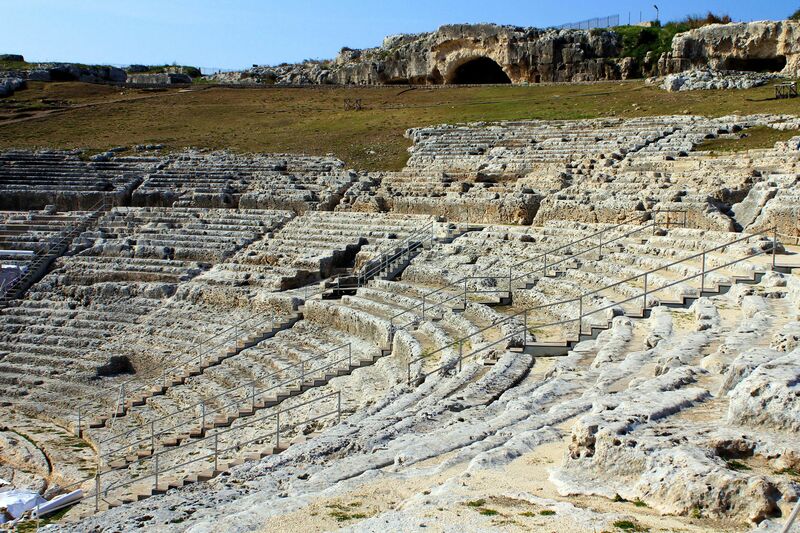 The first theater on the southern side of the Temenite hill was built by Greeks in 5th century BC. Two centuries later major reconstruction works were carried out to enlarge and beautify this important place of public gatherings. Although later Romans made some modifications to answer their less “poetic” needs, its original shape from the 3rd century BC together with impressive acoustics and panoramic views on the sea can be still seen and felt in our times. 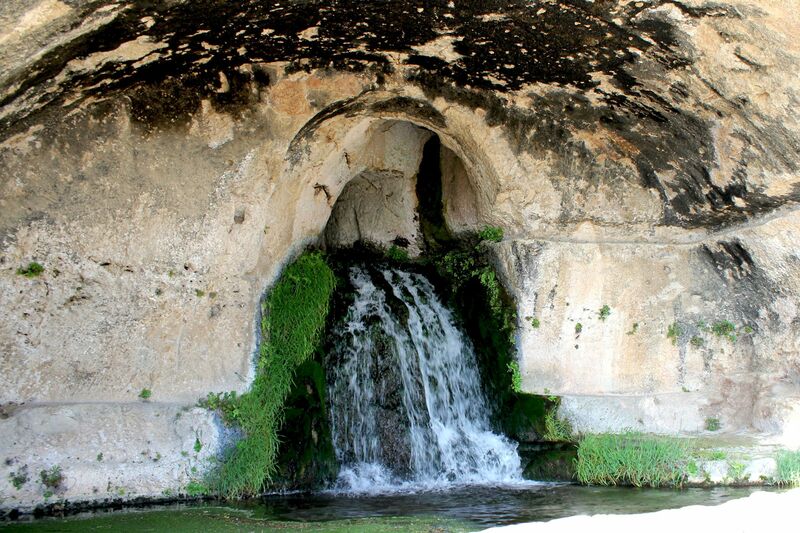 The centrally located Nimphaeum is the most remarkable niche in the rocky cliff. Although Nymphs are gone long time ago, the artificial waterfall fed by an ancient Greek’s aqueduct tirelessly flows to the little pond at its base from where it finds its way out through the underground channels… . 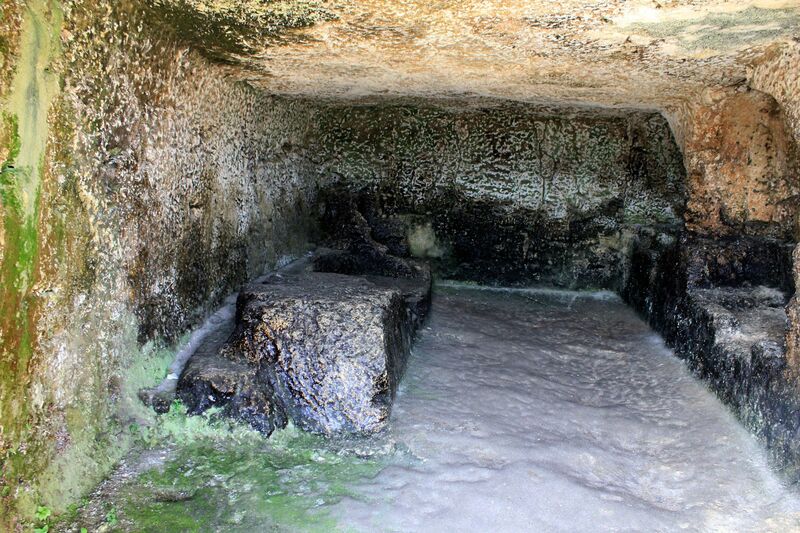 Well, may be it is time to re-introduce Nymphs to this sanctuary of the ancient-Greece? To the left there is a road cut through the rocks. 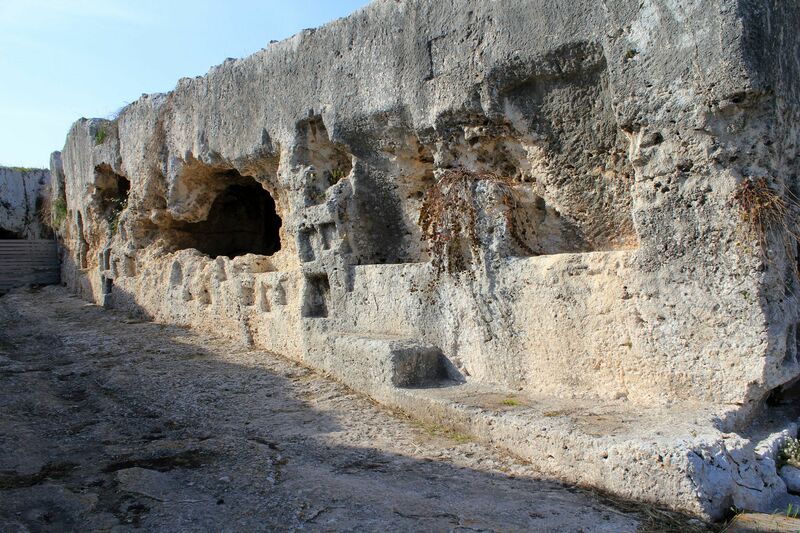 Numerous caves dug in the walls were used in Byzantine times as a cemetery hence the road is sometimes referred to as “Cemetery Road”. Next generations of rulers did not share Greek’s enthusiasm and love for open-air cultural performances. In 16th century, the Spanish king Charles V decided to use amphitheater’s stone blocks to build fortifications around Ortigia. Later, local businessmen established water mills in the auditorium using the water from the old Greek aqueduct that fed Nymphaeum. 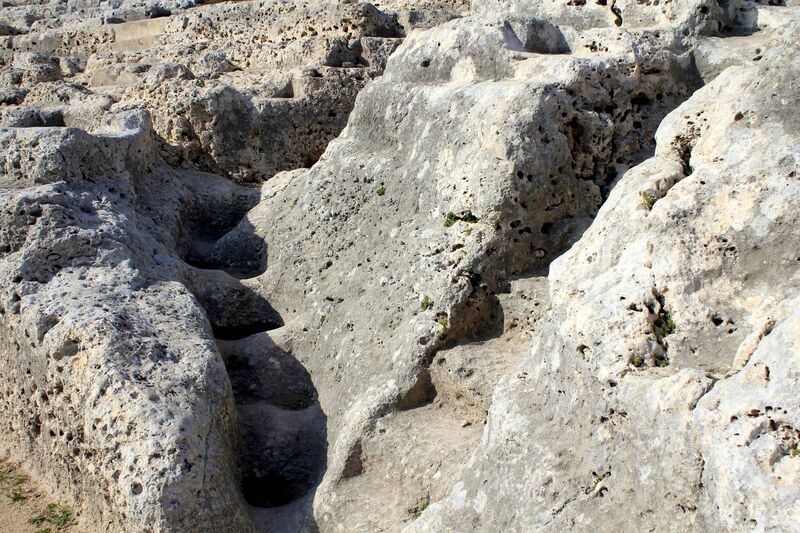 As the result, only the part of the theater that was dug into the rock was left for future generations, sadly – nothing new…. 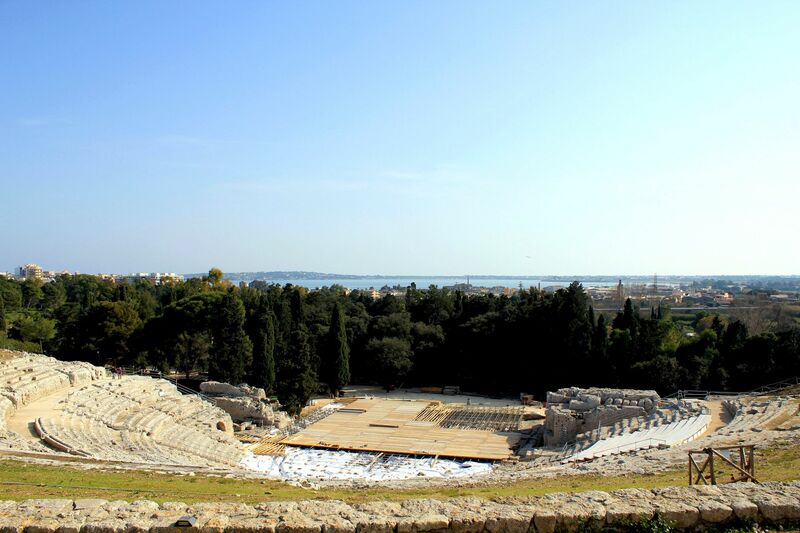 And good news – since 1914 the theater is used for occasional presentations of classical Greek tragedies. Recent “adaptation works” allowed for presentations of music, operas and dance. Although most of the theater structures are gone - acoustics, ambience and scenery are still as perfect as in ancient times greatly adding to the enjoyment of spectators.